Enchiladas originated in Mexico, where the practice of rolling tortillas around other food dates back at least to Mayan times. The people living in the lake region of the Valley of Mexico traditionally ate corn tortillas folded or rolled around small fish. Writing at the time of the Spanish conquistadors, Bernal Díaz del Castillo documented a feast enjoyed by Europeans hosted by Hernan Cortes in Coyoacan, which included foods served in corn tortillas. (Note that the native Nahuatl name for the flat corn bread used was tlaxcallil, the Spanish give it the name tortilla.) In the 19th century, as Mexican cuisine was being memorialized, enchiladas were mentioned in the first Mexican cookbook, El cocinero mexicano ("The Mexican Chef"), published in 1831, and in Mariano Galvan Rivera's Diccionario de Cocina, published in 1845. In a saucepan, heat oil, add flour. Stir well using a wooden spoon. Cook for 1 minute. Add chili powder and cook for 30 seconds. Add stock, tomato paste, oregano, cumin, salt, chipotle sauce, garlic powder, onion powder and cayenne pepper. Stir well. Bring to boil, reduce heat to low and cook for 15 minutes. The sauce will thicken. Adjust seasoning, if desired. Serve over enchiladas. Add ground beef to skillet, breaking meat up as it cooks. Add salt, pepper and half the beer. Once ground beef no longer pink, add remaining beer. Stir well. Cook until beer has reduced. Remove meat from heat and stir in onions. In skillet heat vegetable oil, over medium heat. Place one corn tortillas in hot oil for 10 seconds, then dip tortillas in sauce to lightly coat, then place on plate, cook in batches. On sheet pan add thin layer of sauce. Add 1 1/2 tablespoon meat mixture to corn tortillas, then roll tortillas, place tortillas on sheet pan, seam side down. Top with remaining sauce and cheese. Place sheet pan in preheated 350 degree oven, cook about 15 to 20 minutes. Enjoy! This looks delicious! I haven't had Mexican food in a while, it's about time I make some enchiladas..yum! Can u believe that I never had enchiladas ? This looks lovely .. i really should make it at home. I love enchiladas!!! These look tasty and I like that you made your own sauce! I love the history of enchiladas! So interesting. 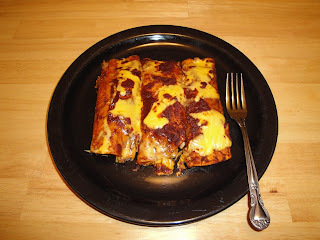 I just made enchiladas last night and can't wait to make them again...yours look tasty! great looking enchiladas! Thanks for the recipe! I had no idea the dish was that old....a lot of history in food! There is a lot of history in food. I love food history. Interesting. This dish sounds delicious with all those yummy flavours!! Great enchilada recipe and I enjoyed reading the history. Well done. Cumin and oregano is a full of flavors, would have a wonderful taste. I love eating enchiladas but I have never been a fan of making them. However, this recipe sounds worth it! Thanks for all of the information, I love learning from you! Love the history bit and your enchiladas looks wonderful. Thank you so much for all your wonderful comments. Y'all mean the world to me. Love y'all. I love enchiladas! Your recipe sounds great & I love that you added a can of beer to the ground beef. Must try this soon!! This is a great reminder that I haven't had Mexican food in a while. I would love to make a big batch of these and freeze them for nights when I don't feel like cooking. Thanks Christine. The enchiladas look wonderful. The history of enchiladas is interesting. They would freeze well. You could also cook the sauce and meat the day before you plan on making enchiladas. That's what I did. Oooh sounds delicious, Christine! The photo is absolutely scrummy! These enchiladas looks absolutely delicious! These look delicious! Enchiladas are always a winner for me, and the addition of the Shiner Bock is very intriguing! I could not believe I missed this one. I made enchiladas this year for the first time. Super good. Yours looks amazing. I always like enchiladas. Being gluten free they are great with corn tortillas. Thanks for stoppping by. I am following you, too. I liked the historical information on Enchiladas. Mexican food is not usually my thing but I might try your recipe but with mature cheddar rather than the cheese suggested. Thanks for the recipe. I've never tried to make Enchiladas before, but these sound really good, so I might just have to give them a try.